The St. George area is a premier vacation destination for hikers, bikers, sight-seers, and international travelers, but occasionally it's nice to sit back, relax, and simply enjoy your surroundings. Fortunately, there are a variety of spas and resorts to facilitate downtime and provide peaceful, healing treatments for both your body and your spirit. Green Valley Spa and Hotel offers an incredible array of packages and programs to promote health, wellness, and calm. In addition to weight loss and stress recovery programs, massages and facials, Green Valley Spa is also home to a treatment center that conducts services ranging from energetics to detox and cleansing, from vibrational medicine to hydrotherapy and personal counseling. These holistic therapies aim to treat physical, emotional, and mental disconnections and achieve a connection with the spirit. 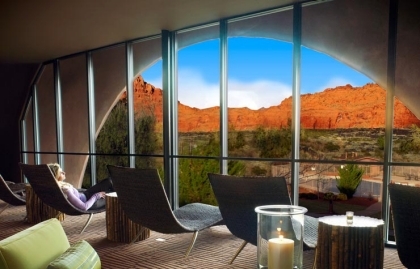 Similarly, Sacred Space, a spa located in Kayenta (a small community that neighbors Ivins) offers standard spa treatments, as well as chakra clearing and balance and cranio-sacral therapy, both of which are designed to restore balance to your body's energy fields. Health and fitness spas are also available to those visiting the area. Spas and resorts with an emphasis on fitness and weight management include the Biggest Loser Resort at Fitness Ridge (affiliated with NBC's The Biggest Loser), Planet Beach Contempo Spa, Red Mountain Resort, and the Inn at Entrada.